A small word “overdue debt” can become the cause of major health breakdown for a person, and it happens in many cases. Debt gives immense stress, especially when you are in short or long-term financial crunch. People at times find it difficult to manage their overdue debt for many reasons. Some of the reasons are analyzed below. But, even without checking those reasons one can say that the bottom line is the financial crunch can outbreak at any moment. As a result, people could face a lot of difficulties to repay their loans as well as credit card bills. So, one must know how to get rid of the Overdue Debt. Now, at first, we need to analyze the reasons why people mostly face the difficulty of debt repayment. Here are those reasons for you at a glance. Paying medical bills of the family members or for yourself could be the reason behind your debt woes. Such problems do not come with prior notice, and thus your financial planning may be completely disrupted due to this reason. Sudden loss of a job can also be a reason behind the failure of paying debt properly. This could happen to anyone, as today’s fast-paced world does not give a job guarantee to anyone. So, now the big question is how to consolidate your debt? There are a few simple techniques to do that. For debt consolidation, you need to find a trustworthy advisor. Nevertheless, you need to know different techniques for debt consolidation. Most of the people think that opting for a debt consolidation loan is the only way, but in reality, there are various other techniques. You can get more info from nationaldebtrelief.com/. You can also talk with the experts here. To start with the debt consolidation process, you need to follow the tips that have been discussed below. If you are facing an overdue debt situation, it could be the ideal time for you to set up an individual voluntary arrangement which is in short known as IVA. If you can successfully set up an IVA, you shall be able to increase the repayment terms of your loans. As a result, paying those loans will be easier for you. So, how to set up the IVA? What are the legal provisions as well as aspects that you must know? All those things have been discussed in detail in the following section. Step – 1: Interim Order: The first step or stage of setting up IVA is to choose an interim order. This will restrict the lenders to take legal actions against you due to nonpayment of the credit card bills or loan repayment premium. For the interim order, you need to make a formal application. The application should disclose your present financial state, and thus it will ask the court to give your relaxation in repaying your overdue debt. Step – 2: Financial Evaluation: At the second step, you need to go for a financial evaluation so that you can prove that you are in an economic crunch and you cannot pay off your overdue debt. A professional auditor will perform this task for you. Step – 3: Creating a Proposal: The third step is to create a proposal so that it could make a lot of changes to your financial planning approach through the establishment of IVA. The proper should be crafted professionally, and thus you can take help of the debt consolidation advisory lawyer for this purpose. Step – 4: Pitching Your Creditors: The final step is to pitch your creditor. You need to contact the creditor and settle your debt repayment. The process could need hard negotiations, but at the end of the day, you shall be managed to get a lot of relief in paying off your overdue debt to the creditors. When you are into a temporary financial crunch, you can go for a debt consolidation loan to pay off your debts. 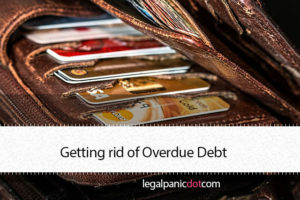 Another reason to opt for debt consolidation is to pay all the overdue debts altogether without increasing the late payment penalties. When you have too many credit card bills to pay, instead of paying them separately, go for a loan and pay all those bills once. Now, you can repay the loan amount of the lender in monthly basis premiums with the rate of interest, as you have agreed to pay to your creditor. For a debt consolidation loan, you need to contact the lender carefully. To contact the lender, you can follow the steps as given below. Contact the Bank: The best and safest lender for a debt consolidation loan is the bank. Basically, the bank will help you to consolidate your debt accurately with a loan allocated with a low rate of interest for repayment. You can enjoy the convenience of paying all your debts in one go, and now you have only to repay your bank loan. Life will become easier as you do not have to keep dates for repayment of overdue debts all the time. Private Lenders: A lot of private lenders are there offering low-cost debt settlement services. You can easily find them and repay your debt with perfection. These lenders also provide a lot of convenience by not asking for your credit score. If a bank has turned down loan application due to your low credit score, these bad credit private lenders will be your saviour. There are several ways to get a loan. Not just your credit score, your expensive possessions can be used for getting a loan. You can apply to the bank for the loan with collateral. For collateral, the most important thing is to go for gold possessions. If you do not have gold possessions, you can go by car or property as collateral to seek a loan amount from the bank. Debt consolidation is a critical thing, and there are some legal bindings with the process. You need to understand the process or debt repayment with accuracy. For the legal advice, you may need a professional lawyer who has experience as well as insight into debt settlement laws. Creditors often take unlawful means to extort money from the defaulter debtors. So, you need to understand your legal rights carefully. Want to Know How to Get Rid of Overdue Debt?